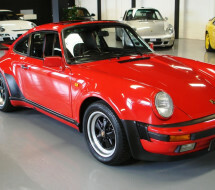 There are some Porsche collectors that like to fill their garages with only the marque’s vehicles. With a model range that includes sports cars, SUVs and luxury sedans, that’s an entirely plausible approach to covering all one’s automotive needs and desires. 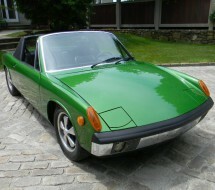 It seems to work for Jerry Seinfeld, perhaps the world’s most recognizable Porsche collector. Premier Financial Services could help you do the same. 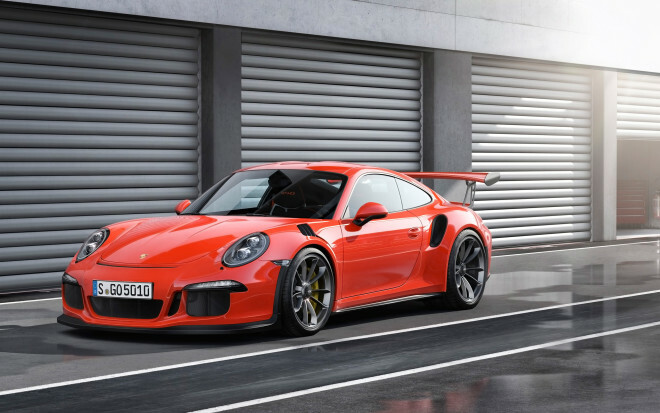 Should you wish to lease one of the 25 variants of the current Porsche 911 including the GT3 RS, a 918 Spyder or prefer something vintage, such as a 1973 911 Carrera RS 2.7 or a 1964 904 Carrera GTS, PFS can assist you. 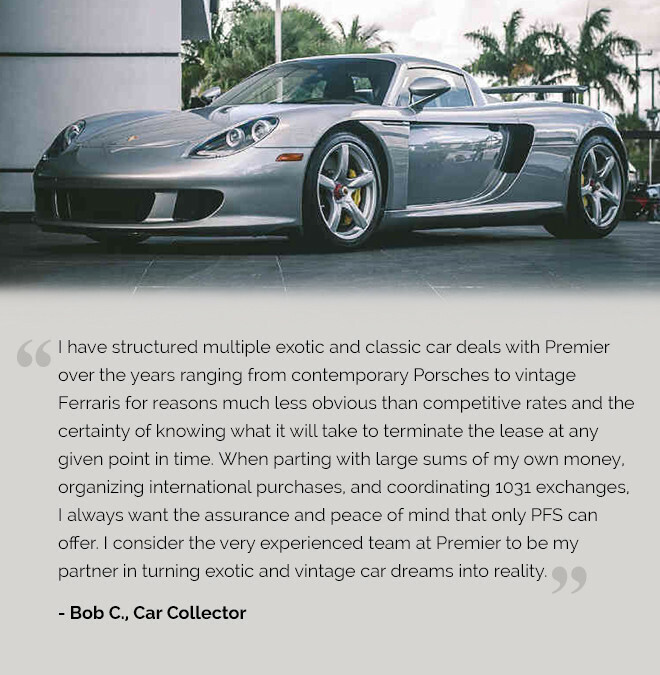 Whether the Porsche you want is offered at an auction or by a private seller, in the U.S. or abroad, Premier has the resources to help you get a car appraised, purchased for lease and even shipped to your home. 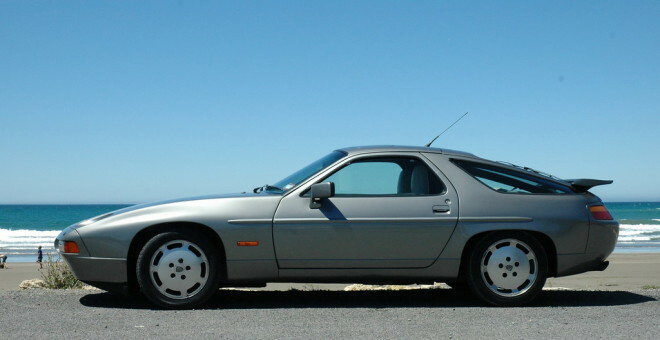 If there are bragging points for humblest beginnings for a sports car, then Porsche wins. 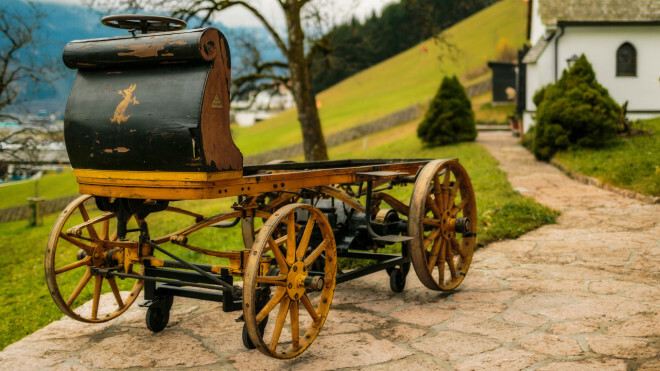 Ferdinand Porsche could count the world’s first gas-electric hybrid, the 1901 Lohner-Porsche, and the Auto Union grand prix race cars among his engineering masterpieces. But it was the lowly Volkswagen Type 1 – a.k.a. Beetle — that brought Porsche’s engineering to the masses after WWII, and it was that same lowly VW that provided building blocks for the first Porsche sports car, the 356. From that arose a sports car and racing dynasty without parallel. 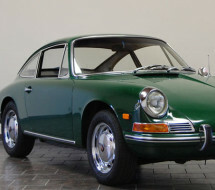 Though the first Porsches mustered only 40 horsepower from their rear-mounted VW-based air-cooled engines, low weight and superb aerodynamics enabled a top speed of 80 mph. Not surprisingly, racing figured prominently in Porsche’s operation from the start. 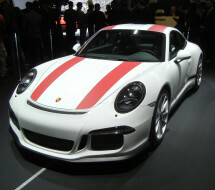 Rapid, relentless development and improvement became a Porsche signature. Power steadily climbed, and so did sales. 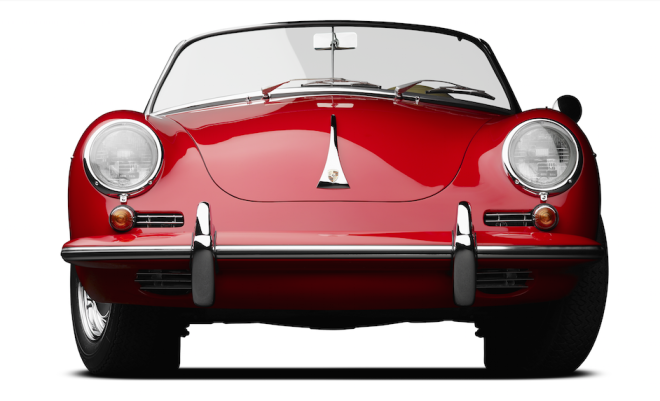 Porsche built its 5,000th 356 in 1951. The first of Porsche’s many legendary race cars, the mid-engine 550 Spyder, arrived in 1953 and became a “giant killer” by taking on much heavier machinery from Aston Martin, Ferrari, Jaguar and others. 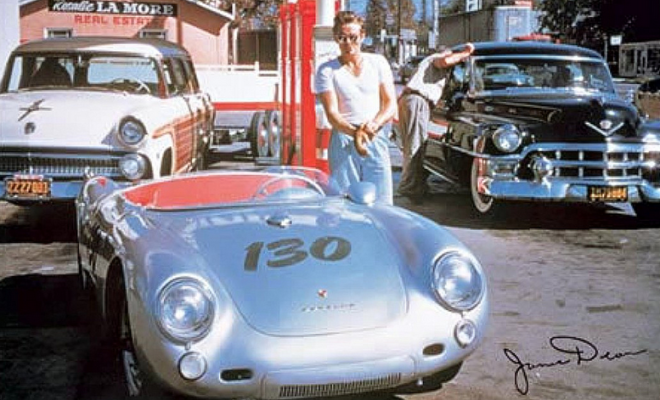 Despite a stellar race record, the 550 Spyder is more often linked to the crash that killed actor and race driver James Dean in early fall 1955. 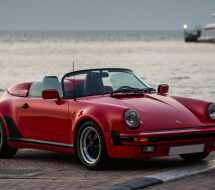 Porsche’s racing DNA carried into its road cars, including the stripped-down 356 Speedster that has since become one of the most collectible of all early Porsches. The 356 lasted 17 years, but if anyone thought an rear-mounted air-cooled engine was archaic for a sports car, Porsche had news: the configuration would continue, but now with six cylinders for its successor, the 911. Rally drivers loved the fast, oversteering 911, and rally wins were among the first in an ongoing run of competition successes. 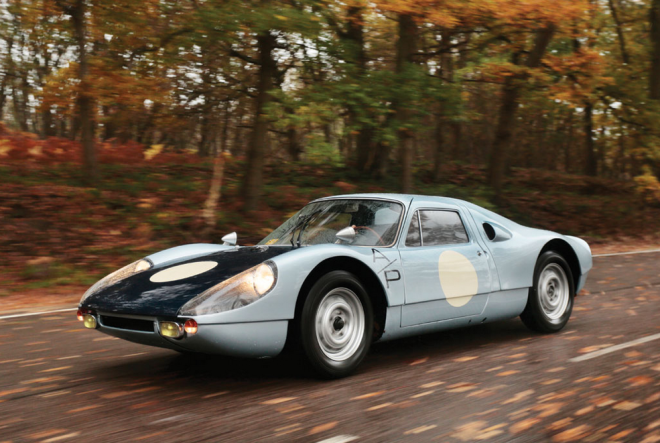 Around the 911’s debut, Porsche began a concerted effort in endurance racing with the 904 Carrera GTS. The line of development would lead to the formidable 917, which gave Porsche its first of 17 Le Mans victories – the most of any marque, with the most recent in 2015. Another uber-cool actor and race driver, Steve McQueen, drove Porsches in the 1971 movie “Le Mans” and also in private life. 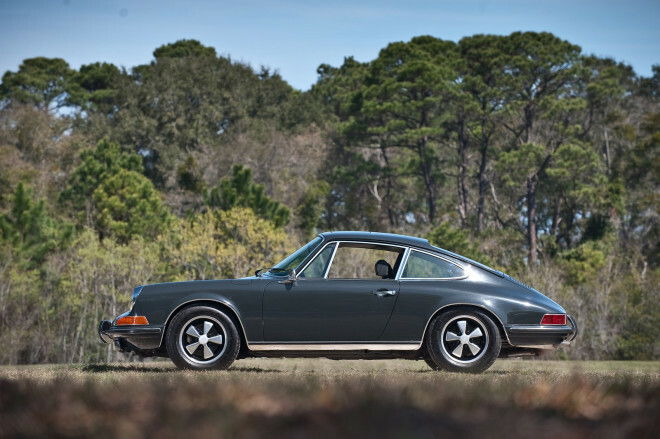 Porsche recovered from a 1980s slump by refocusing on the 911. 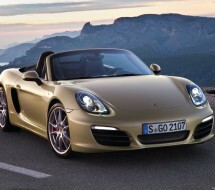 How far could Porsche take the basic concept? 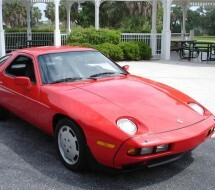 The 1986 959 supercar answered with all-wheel drive, a 444-hp engine, 195 mph top speed and advanced lightweight construction. 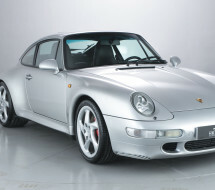 The 959 presaged all-wheel drive for the 911 Carrera and Turbo, along with the switch to liquid cooling in the late 1990s. Bill Gates bought a 959, though he waited more than a decade for it to clear customs, since it was not officially imported to the U.S. The 959 now is legal to import to the U.S. and there is one on lease in the PFS portfolio. 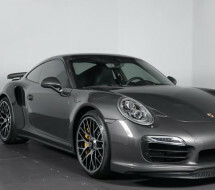 Many owners still drive their 911s hard, on road and track. 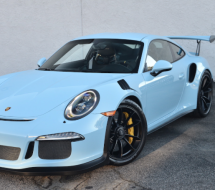 With vintage 911 values following an upward trajectory, getting to know the experts at Premier Financial Services should be the first move toward acquiring one. 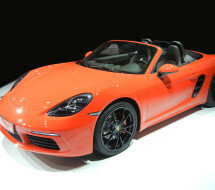 Porsche shifted into full resurgence mode with the mid-engine Boxster in 1997, then doubled down on the 911 and eventually gave the Boxster a coupe companion, the Cayman. 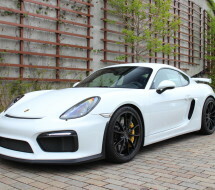 In between, it did the completely unpredictable, debuting the Cayenne sport-utility and then the V-10, mid-engine Carrera GT supercar which Premier has been leasing since their inception in 2004. The Cayenne expanded the marque’s reach and opened the door for the Panamera sedan and then the smaller Macan SUV. 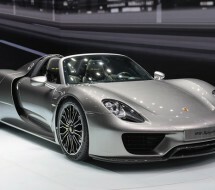 Sports car development continued full-throttle, and Porsche pulled a page from Ferrari’s playbook by limiting production of its 887-horsepower 918 Spyder hybrid supercar to 918 cars. 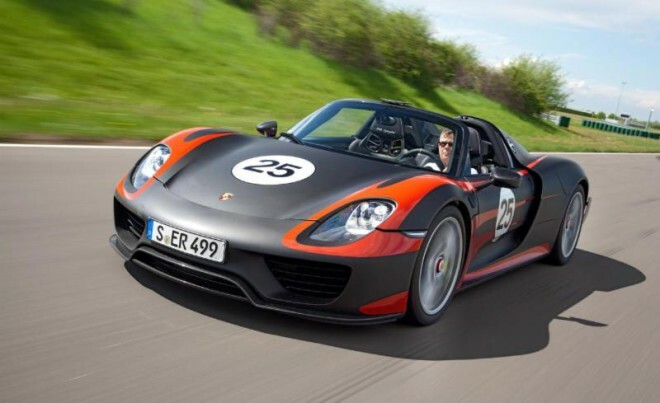 If you did not join Jay Leno and AC/DC singer Brian Johnson on the owner roster, take heart: PFS has leased the 918 Spyder, too.